1969’s All Monsters Attack (AKA Godzilla’s Revenge) is hands-down the worst Godzilla film ever made – and yes, that statement is taking into account Roland Emmerich’s disastrous 1998 Hollywood reboot. 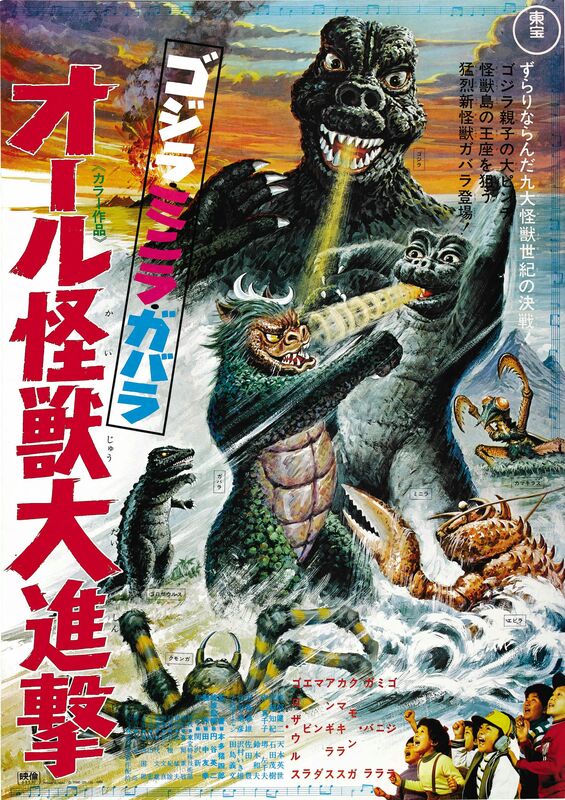 It’s a lazily, almost disdainfully conceived film that is aimed squarely at children and features a significant amount of shamelessly recycled footage from previous Godzilla films, including the climactic fight scenes from Godzilla vs. the Sea Monster and Son of Godzilla. The story is about a young boy named Ichiro who lives in a heavily industrialized area of Japan. Despite behaving pretty much exactly as you’d expect a boy of his age to, Ichiro is considered a bit of an oddball by his parents, and is constantly bullied by a gang of children. 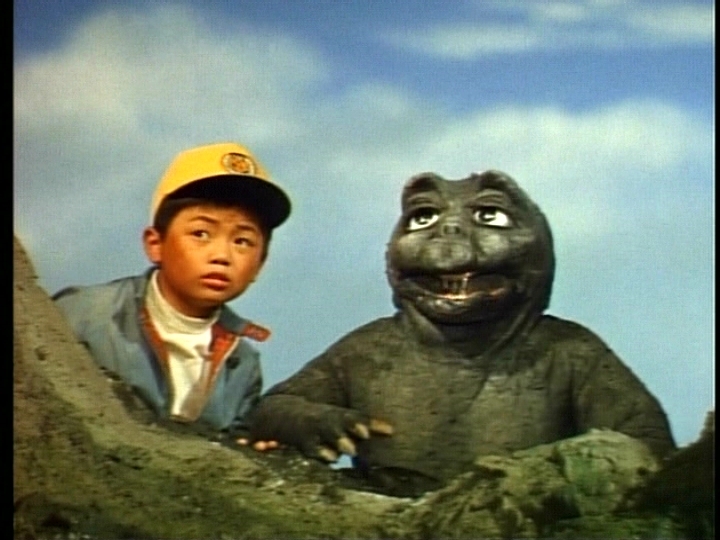 Lacking the courage to fight back, Ichiro retreats into his imagination where he is friends with Godzilla’s son, Minilla, who is now human-sized and able to speak Ichiro’s language. After Ichiro and Minilla witness Godzilla defeat several mantis-like Kamacuras (a clip from Son of Godzilla), Minilla reveals that he too is being pestered by a bully in the form of a stupid-looking monster named Gabara, whose slightly feline-like appearance is complemented by his “roar,” which sounds like the yowling of a cat in heat. After inexplicably growing several hundred feet in a matter of seconds, Minilla attempts to fight Gabara one-on-one, but is defeated in humiliating fashion and forced to retreat. Back in the real world, Ichiro stumbles upon an abandoned factory that is being used as a hideout by two on-the-run bank robbers. Several contrivances later, the robbers kidnap and tie up Ichiro, who again retreats into his imagination. 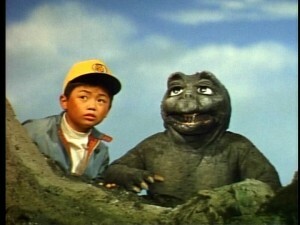 Looking to bolster his courage, Ichiro seeks out Minilla, who is still being tormented by Gabara. After being inspired by several more clips of fight scenes from other Godzilla films, Minilla challenges Gabara once again and finally defeats him. Incensed by his failure, Gabara launches a desperate attack on Godzilla, who easily thrashes the worthless kaiju. 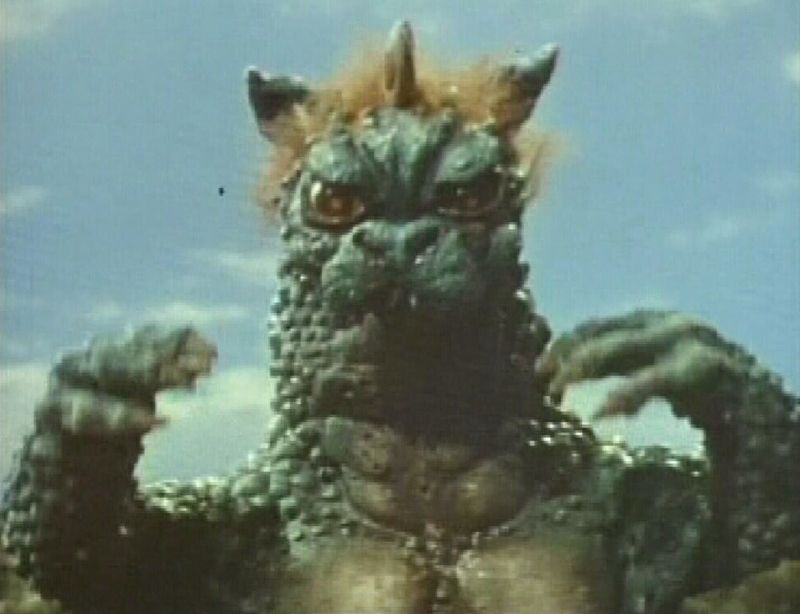 Inspired by Minilla’s actions, Ichiro decides to fight back against the bank robbers who are holding him captive. He manages to untie himself and attacks the robbers before managing to escape the abandoned factory. The robbers nearly catch up to Ichiro, but a group of police officers appears and apprehends the villains. The next day, Ichiro is once again confronted by the gang of young bullies, but this time he stands up to them and wins them over as friends. While Ichiro’s tale has a happy ending, the audience that had to sit through this catastrophe isn’t so fortunate. All Monsters Attack’s heavy reliance on stock footage and intense focus on a younger audience contribute toward it being an exceptionally weak Godzilla film, but it’s not entirely lacking in entertainment value. The English dubbed version, in which Minilla sounds like a dimwitted relative of Barney the dinosaur, is somewhat amusing in its campiness. The dubbed voice for Ichiro is especially funny, though rather grating; he sounds more like Lucille Ball than a young boy. On the other side of the aural spectrum, the strangely aggressive and trippy jazz soundtrack sounds like something Quentin Tarantino would sample for one of his films. Several other aspects of the film are also in “so bad it’s good” territory. Ichiro’s bizarre friendship with a middle-aged inventor is bafflingly inappropriate and never fully (or even partially) explained. The dumb-as-rocks bank robbers provide a bit of unintended comic relief, especially when the head robber (you know he’s especially bad because he wears sunglasses at night!) lunges at Ichiro in slow-motion. It’s clearly meant to be frightening, but I couldn’t stop laughing. It’s also easy to laugh at the film’s misguided moralizing. In the final scene, Ichiro impresses the bullies who hound him by doing the irresponsible thing they wanted him to do all along. Not a good message for the youngsters this is aimed at. The Godzilla series had some stinkers before this film, but always managed to bounce back with a decent follow-up. Unfortunately, All Monsters Attack marks the beginning of a losing streak of films, though nothing else comes remotely close to its badness. Skip this insipid mess unless you only want to laugh at the absurdity of it all.